Well since we haven’t really made a birthday project since 2008 I decided to definitely change that this year. And also because danieljradcliffe.tk has it’s 5th Anniversary this year. Another reason to celebrate! So we start early this year. This time, a little change. We decided to partner up with our neighbour site from Germany danielradcliffe.de and we now have a three- part project together. "Bigger. Better, and for a good cause: Three part project"
- All contributions help the children, the parents and the organization of Demelza. "Happy Birthday, Daniel!" or another short sentence! Of course you can also draw something on the paper. I mean if you don’t want to write something! But if you write a short message, please look that you write BIG and don’t write too much! Please note the picture will be reduced on normal Photo-Size. That means 10x15cm [normal postcard size] and of course the words ought to be clearly recognisable! The message has to be in english! And please no naked or half naked photos and no insults and innuendos! 2. A short message from you to Daniel. That can be a letter, a poem or a birthday card! The main point is that the text is not longer than a half Din A4-side! Because the album is not soooo big! ;D And of course the Text has to be in english! Clear or not? And again no insults and innuendos! Of course you can decorate your letters! Would be great! 3. A drawing from you for him. It doesn’t matter what you add on it! A flower field, a animal or what ever! Just a picture, what you want to share with Daniel! 4. Something what you tinkered! 5. You can be more creative than us and send us a quite different thing. A idea we didn’t think about! Please remember to send us you name (or Nickname if you want), your Age and your Land / Town, or just your name, if you don’t want to tell us. You can send us everything by e-mail or by post. If you sent a drawing or a self tinkered thing, you better send it by post. Please share this page to family/friends and on Facebook and Twitter. If you still have questions, please don't hesistate to ask Mira and/or me. You have e-mailed me.. about the project,but somehow I can't reply, so if you maybe please can contact me again via e-mail or twitter? 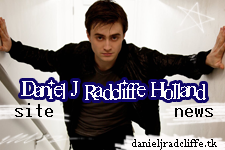 (@DanJRadcliffeNL) thanks!